Sometime in October 2009 a strange incident occurred in a field in Silbury Hill. A police officer who was on duty to investigate the recent crop circles who had been produced there, was on a routine schedule to find out if the perpetrators had left anything behind. The owner of the field was concerned that the people who had done the intricate design in his crop would return and damage another portion of his crop. Thus, the police officer was at the sight, for some reason alone when the incident occurred. What he saw was a very tall human-like creature, which, when approached turned out to have electrified the area in which it was stationed, as static electricity could be felt in the area. However, when the creature discovered that it had been spotted and followed it immediately started running, allegedly at a speed which exceeds that of any human being. In no time no traces of the creature were visible and the police officer had to discontinue his pursuit. No further evidence was collected at the sight and it is unclear whether the officer was telling the truth or whether he was lying but further testing of the area did manage to uncover a very light trace of radioactivity in the region. 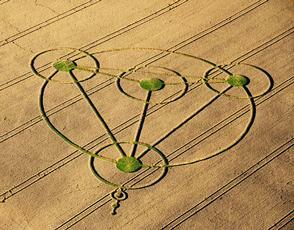 Maybe it was planted there by the perpetrators or maybe, indeed the crop circle was produced by the entity. Since the incident no further crop circles have been produced in the area, and no one was arrested following the investigation. It is however one of the few recounts where actual proof that there was some sort of electric field remaining behind at the scene was discovered, but again, reading too much into it can lead to false conclusions.